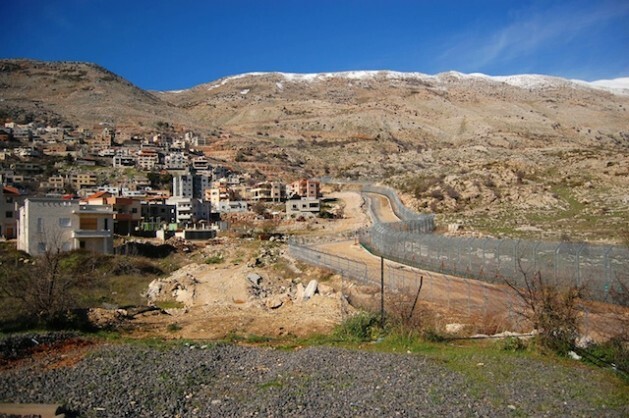 The fence and army road separates Majdal Shams from 'Syria proper'. Credit: Jillian Kestler-D’Amours/IPS. MAJDAL SHAMS, Occupied Golan Heights, Feb 7 2013 (IPS) - After Israeli war planes reportedly bombed targets in Syrian territory last week, individuals and groups in the Israeli-occupied Golan Heights are quietly preparing for the possibility of escalating violence between Syria and Israel. “We can feel that the presence of the Israeli army in the Golan has been increasing in the last week. People started to prepare for a war situation,” said Dr. Taiseer Maray, director general of the local group Golan for the Development of the Arab Villages. Israeli security sources reported this week that an Iron Dome missile defence system had been placed on Israel’s northern border with Syria and Lebanon. The move came less than a week after Israeli jets were suspected to have bombed a weapons convoy inside Syria, near the Lebanese border. Media reports speculated that the weapons were destined for Lebanese resistance group Hezbollah, which fought a month-long war with Israel in 2006. The Syrian government, however, said a scientific research centre on the outskirts of Damascus was the target of the Israeli raid. Syrian officials accused Israel of trying to “destabilise” Syria. They also used the Israeli attack to discredit the opposition movement in Syria, arguing it proved that external forces are responsible for the ongoing uprising against President Bashar Assad. Fighting between the Syrian army and Syrian resistance groups aiming to oust President Assad has left over 60,000 Syrians dead and forced up to one million people to flee as refugees to neighbouring countries, the United Nations estimates. According to Maray, as Israel increasingly threatens to become involved militarily in the conflict, preparations for emergency field clinics in the Golan Heights, and across the Israel-Syria ceasefire line are now being planned, should Israel occupy more Syrian land. “Any kind of fighting, or any movement of (the Israeli) army, will be via the Golan Heights. This makes the Golan a really sensitive area. We try to prepare the shelters. We try to keep more food in our houses, just to be ready for such a possibility,” Maray told IPS from his office in Majdal Shams, the largest Syrian-Arab village in the area. In 1967, Israel occupied the Golan Heights, a mountainous region and fertile plateau bordered by Lebanon, Jordan and northern Israel. Israel annexed the Golan in 1981 and extended its laws to the territory in a move that is considered illegal by the international community. About 20,000 Syrian Arabs live in a handful of communities in the Golan Heights, including the largest and northernmost village, Majdal Shams, which lies only 60 kilometres from Damascus. Most Syrian-Arab residents of the Golan are members of the Druze religious minority. Today, community members hold Israeli ID cards and are considered permanent residents of Israel. Since the Syrian uprising began, Golan residents have been divided between supporting the Assad government and supporting the opposition movement. In Majdal Shams, physical violence has erupted between the two sides. “I think every day Assad is losing popularity. It’s not politics. What’s taking place in Syria became a very basic humanitarian thing: people have the right to life,” said Salman Falkredeen, an activist at Al-Marsad, a human rights centre in Majdal Shams. Speaking from the Al-Marsad office, as the sound of bombs went off in the distance just over the hills of southwestern Syria, Falkredeen said the Syrian uprising has amplified local demands for the end of the ongoing Israeli occupation of the Golan Heights. He added that while the Syrian revolution has had minor, direct impact on the lives of the people in the Golan Heights – young people were barred from studying in Syria, and farmers were unable to market their apples in Damascus, for example – it will have a lasting effect on political consciousness. This was an outstanding piece of writing. I commend J. D’Amours for how she presented the information. Just to note one portion of text: ““I think every day Assad is losing popularity. It’s not politics. What’s taking place in Syria became a very basic humanitarian thing: people have the right to life,” said Salman Falkredeen, an activist at Al-Marsad, a human rights centre in Majdal Shams.”….For Americans who fought their own battles to gain democracy, basic human rights, and freedom, we certainly empathise what you are going through. The last two pararaphs were paramount when he noted that all Syrians were gaining political experience through all of this. I can only comment with the old adage, ‘you must learn to crawl before you can walk.’ Syria’s issues, however, are affecting all of us whether here or there and so we pray, and pray some more that it ends soon. Thank you so much for your insight.